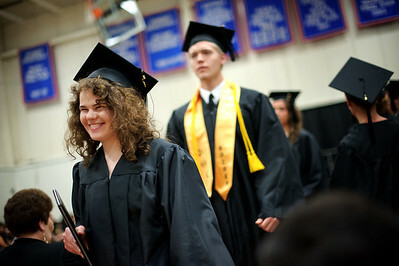 Daniel J. Murphy - dmurphy@shawmedia.com Rebecca Burns, 20, of Crystal Lake leaves the Spring Commencement ceremony with an Associates in Science degree Saturday May 12, 2012 at McHenry County College in Crystal Lake. 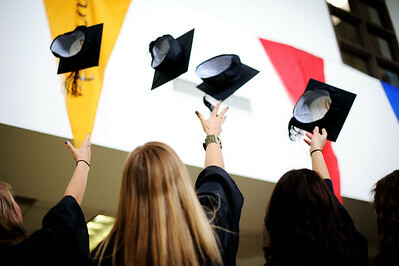 Daniel J. Murphy - dmurphy@shawmedia.com From Left: Samantha Brunshaber,18, Devin Beveridge, 17, Hannah Howorth, 16, and Natalie Nystrom, 18, all from Huntley throw up their caps after the Spring Commencement ceremony Saturday May 12, 2012 at McHenry County College in Crystal Lake. They graduated with a Certified Nurse Assistant degree. Daniel J. Murphy - dmurphy@shawmedia.com Jasmine Willens, 21, (left) of Woodstock and Jhaniz Pactol of Cary file into the gymnasium for the Spring Commencement ceremony Saturday May 12, 2012 at McHenry County College in Crystal Lake. Willens and Pactol both graduated with a Certified Nurse Assistant degree. Rebecca Burns, 20, of Crystal Lake leaves the Spring Commencement ceremony with an Associates in Science degree Saturday May 12, 2012 at McHenry County College in Crystal Lake.